The self-driving car is getting close to our real life recently. IT saints such as Google, Apple and Amazon are developing their self-driving car. Whereas traditional vehicle companies are also doing their research. Volvo has developed self-parking function while Tesla has released it’s “autopilot” function in it’s Model S series, and Audi’s next generation of self-driving car is in its prototype phase and is under user research and testing. As the technology becoming mature, do we really know how we want the car to behave when it’s driving by itself? How it could be designed so that people interact with it naturally and safely? The question comes to the user experience design in the self-driving car. Though it’s a new area to explore in UX, I think some framework would be useful to help me understand the context within a car system. “PACT”(People, Activity, Context and Technology) is a useful framework in HCI to think about the design situation(Designing Interactive System 2nd Ed pp.31). So I am gonna use this framework to analyse the situation in the self-driving car. People: Drivers vary in their physical abilities(eye sight, hearing, spacial ability, reaction speed, ability to focus, memorisation etc. ), as well as their mental model and social difference( which might lead to their different preference, experience and driving habits). Firstly, difference in physical ability should be considered when designing self-driving system. In California, teens up to 15 1/2 could start driving and there is no maximum age limits. For newbie drivers, additional guidance and information should be easily accessed while for elderly people, large font on the display of information needs to be considered. Secondly, the system should be designed to interact with users in a way that they are able to form a relatively accurate mental model of it. This requires designers to make the information accessible, and also provide timely feedbacks. Thirdly, as people have different motivation and goals, social difference should also be considered. For example, a techie driver might want to know detailed data when the car is self-driving, whereas a beginner might only need to know the necessary information to keep safe rather than overwhelming information that might make him or her anxious. Moreover, in a driving car, not only the drivers should be considered but also the passengers in the car. Similar as riding a car with a driver, when a car is driving by itself, the passengers also need to feel safe and know what is going on. Some infotainment might be provided as well. Activity: When driving a car or on a self-driving car, activities differs in whether it is frequent or not; whether it’s under time pressure or with no time restrict; and whether it could be done by driver alone or needs cooperation between drivers and riders. For example, a driver might ask his or her shotgun to input the restaurant address they are going for dinner to the car navigation on their way home. And there might be incoming calls which left for the driver to decide to pick up or call back later. Basic activities including driving the steering wheel, looking at the navigation, picking up incoming calls, listening to radios or music, chatting with passengers, etc. Whether it’s a frequent activity varies by person. The main purpose of the activities on a self-driving car is to remain safety, followed by other purpose such as provide information and entertainment. Though the safety is partly rely on the technical part, the interface and interaction inside the car is also very important to make people in the car to feel safe. For example, the Audi A7 provides a wireframe of the car driving situation to inform drivers when in self-driving mode. Enabling drivers know why the car is taking a certain action help drivers build trust on and feel safe about the system. Context: As the self-driving system is used in a constrained space, difference in day time and weather condition outside would effect the physical context in car. Another important point about the physical context is that people are in a mobile situation where the road condition, other cars and everything is constantly changing. Therefore drivers are required to pay attention to some extent while multi-tasking. Also, the social context differs between driving along and driving with others, whom could be friends, family, or strangers. Drivers might behave differently in the social context mentioned above, so it is similar with the self-driving system. In the end, other cars, pedestrians on the road should be taken into consideration as well. Whether a car should “tell” other cars and pedestrians which mode it is in right now still worth discussion. 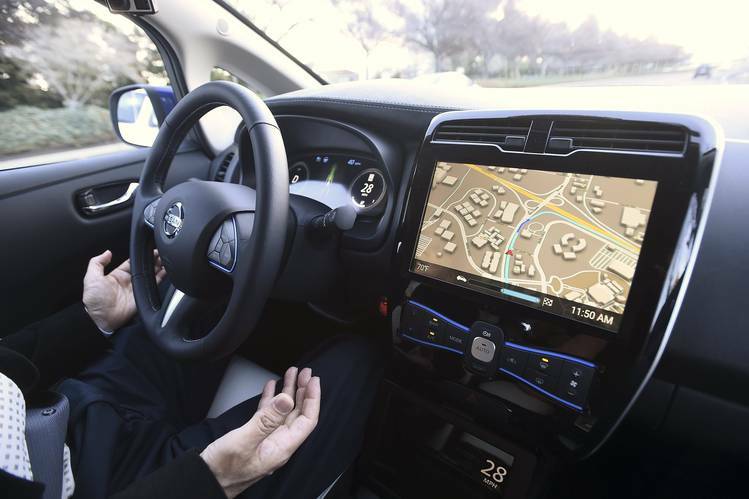 Technology: For the self-driving system, the input involves how the driver could trigger the self-driving mode, whereas the outputs are the current mode the car is in. If it’s in the self-driving mode, it needs to inform the driver what the car is going to do, what it can see. And also the transition between modes should be clearly informed to the driver. How to facilitate the inputs and outputs? Sounds, visual display and haptics could be used and customer’s driving habits should be considered. For input, the design should bear affordance and error prevention. Since it’s dangerous if a driver could turn a car into self-driving mode easily and carelessly, this input need to be designed to be accomplished by some effort. A good example could be in Audi A7, driver’s should tap two button at same time using both hands to trigger the mode transaction. On the other hand, although the touchscreen might be the updated technology, study showed that most users found physical buttons easier and more natural to use as input, and the touchscreen could be used as a supplement. For outputs, when designers wants to introduce a new visual language to indicate “safe and successful”, the light of green might be preferred than red or yellow. A waggle on the steering wheel could be a feedback from the car to confirm user that it’s taking control. Summary: self-driving car system is an exciting new technology where the interaction and user experiences should be carefully designed. The drivers and passengers’ should be considered of their difference in ability and habits. They should be able to establish trust with the system through interaction, feeling safe and in control. The mobile context should also be considered and the technology should be used based on user’s past experience and preferences. You are more than welcome to Email me or tweet me if you have more thoughts on self-driving cars!